Blood samples from children treated at Nair Hospital in 2012 contained bacteria called burkholderia cenocepacia complex (BCC). 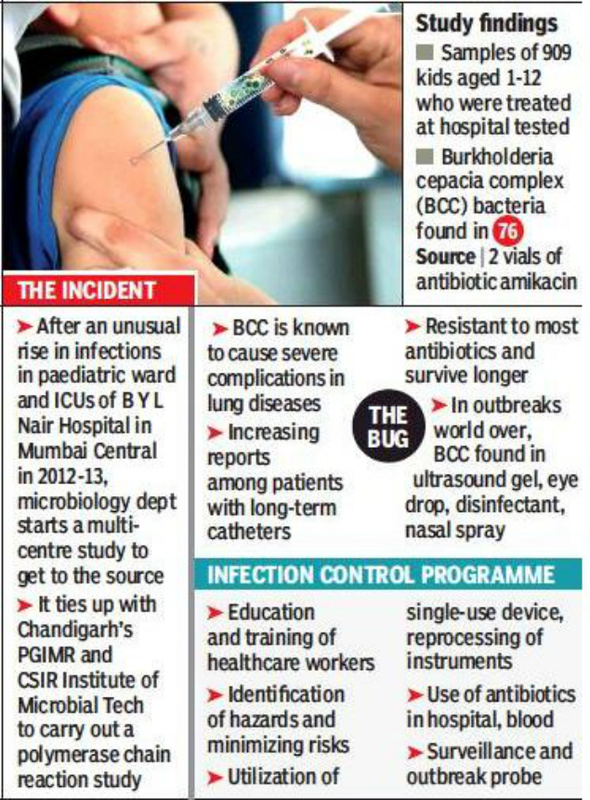 The genomic study of the blood samples linked the infection in children with its source – medicine vial, which proved that BCC is common in India’s hospitals, and it can feed on antibiotics – the medicine meant to kill BCC. In 2012, the paediatric department observed that several children undergoing treatment at the PICU wards suffered from recurrent infections. It found that common invasive procedures such as IV catheterization were performed on the children, with some children being on ventilator. At least 57 of the 76 children had received amikacin. Children who were not administered amikacin and still got the infection, showed a lack of adherence to the infection control protocols. According to the study published in Frontiers of Microbiology and the Indian Journal of Microbiology, while 42 children responded to treatment, 21 succumbed and 13 were lost during follow-up. The study was exceptional as Indian researchers carried it out without any help from foreign researchers. Using specific polymerase chain reaction markers designed by IMTECH team under Dr Prabhu B Patil, the PGI team found the strain in patients from north India. “With the help of molecular tests, we could establish that the genome sequence of the bacteria from blood samples of the children and the cap of the amikacin vial was the exact same, thereby establishing the source of contamination without any room for doubt,” said Dr Vikas Gautam, Professor of microbiology from PGI, Chandigarh.